Who, What, Why: What exactly is a Cornish pasty? 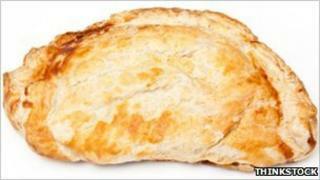 Cornish pasties have been given protected status by the European Commission. So how do you define this savoury foodstuff? It has been a long journey from the tin mines of Cornwall to the corridors of Brussels, but a lunchtime dish familiar to millions is now about to get the recognition its fans insist it deserves. Following a nine-year campaign by producers, the Cornish pasty has been given Protected Geographical Indication (PGI) status - elevating it to a culinary pedestal alongside Camembert cheese and Parma ham. From mid-March, only those pasties produced in Cornwall can be called Cornish. An authentic example should have a distinctive "D" shape and be crimped, or folded into a rope-like pattern, on one side - never on top, says Phil Ugalde of the Cornish Pasty Association, which first applied for protected status in 2002. The rules also state that the filling needs to be "chunky", made up of "mince or chunks of beef with swede, potato and onion and a light seasoning". This is then wrapped in pastry glazed with milk or egg, and then slow-baked. Additionally, the pastry must be "robust enough to retain its shape throughout the cooking and cooling process without splitting or cracking". The pasty itself should be made up of at least 12.5% meat. No artificial flavourings or additives can be used and all ingredients must go into the pasty raw. In order to earn a PGI designation, the dish could still be baked elsewhere in Britain but would need to have been prepared in Cornwall. As a result, those produced outside the county, and those with such flavours as lamb and mint, chicken balti and vegetarian will still exist - but these can only be labelled as pasties, not Cornish pasties. The dish now joins Whitstable oysters and Scotch lamb as one of 19 UK products given PGI status. According to Mr Ugalde, the designation will be a huge boost to members of the CPA, who produce 106 million pasties a year, worth a total of £65m per annum - a figure equivalent to 3% of Cornwall's gross domestic product. But, he believes, the cultural impact will be even greater. "If you know anything about Cornwall, you know that pasty-making is a very emotive subject," he says. "People feel very proud of it - this was the original fast food." Indeed, the evolution of the pasty in the county has been long and distinguished. Les Merton, author of The Official Encyclopaedia of the Cornish Pasty, points to cave paintings on the Lizard peninsula showing a woman eating a pasty-like foodstuff, suggesting the tradition stretches back to prehistoric times. A very early pasty, he believes, would have been encased in leaves rather than pastry, but he says the evidence nonetheless suggests that even such primitive versions would have had their edges crimped in some way. Though the Oxford English Dictionary suggests that the pasty was identified in around 1300, Mr Merton says that it was with the advent of tin mining that it took hold in the county. The self-contained nature of the dish meant that miners could easily carry it underground, he adds, and the crust could be held onto with dirty hands and then thrown away without eating - arsenic poisoning being an occupational hazard of working with tin. Other traditions, which have not made it into the PGI formula, insist that skirt steak - known locally as "chuck" - is used as meat and that the pasty is branded with the initials of its owner, so miners could eat part of it and retrieve the rest later. However, although it is widely believed that pasties were produced with one savoury and one sweet half, Mr Merton says this does not appear to have ever been common practice. He also argues that, whatever the European Commission rules might say, a genuine Cornish pasty should never be baked in what he calls "the country next door to us, England". He says: "Pasties are in our genes. The skills and knowledge are passed from generation to generation." Nonetheless, the emigration of large numbers of Cornish miners in the 19th and 20th Centuries resulted in a significant pasty diaspora in the US, Australia, New Zealand, Mexico and Brazil. An annual Pasty Fest is held every July in Calumet, Michigan. The protected status reflects a wider move upmarket for a product once commonly associated outside its indigenous region with refrigerator cabinets in motorway service stations. For example, the West Cornwall Pasty Company, founded in 1998 with a business plan to offer a more refined product to consumers outside the county, was sold to a private equity house in 2007 after years of sustained growth.